Kogan has announced the launch of its new 8-inch Wi-Fi LCD Digital Photo Frame, which features 8″ LCD display with 800×600 pixels resolution, 256MB on-board memory, wireless connectivity and own email address, supporting iPhone by simply download the free SeeFrame app from Apple App Store. Direct Photo Emailing to Frame – Each frame has its own unique email address so that photos can be received from PCs or mobile phones, protecting against unwanted photos thanks to built-in email filter. Group Frames – Family and friends can set up a single email address that corresponds to multiple frames so that photos can be easily shared and displayed on those frames. Smart Photo Play List – Users can selecte photos to be displayed on the Kogan frame on specified dates, like displaying selected photos on a user’s birthday or anniversary. Email Photos from Frame – Users can send photos directly from the frames to Web account and the email accounts of their family and friends. Auto Power Saving – The frame can be programmed to turn-off automatically at night aimed to save power and protect the screen. 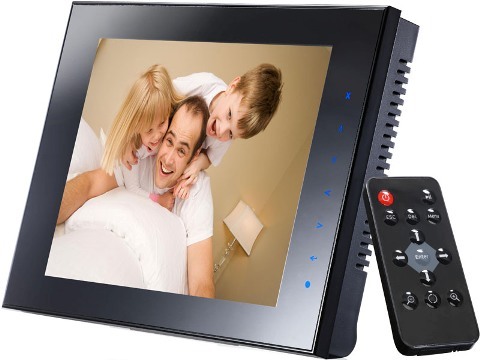 The new Kogan 8-inch Wi-Fi digital photo frame which includes a remote control is slated to be available on 10th July 2009 for $169.